We are the first Startup in the SAP services market, providing an online consulting model through a smart and 100% digital platform. The company has been created in 2017 by recognizable experienced professionals with almost 20 years working in SAP projects each of. We are a unique company, with a startup DNA, flexibility and simplicity as our main characteristics, our goal defined by the disruption of the current business model. Our mission is to improve the SAP professional allocation services using the most up to date technology available, remove any business processes barrier and optimize the allocation of SAP consultants. Our platform was not designed only to search, instead, we would like to change the way you do business with your current consultancy firm by providing everything that you need to allocate a SAP consultant online and without bureaucracy. You have a project or a very specific SAP demand, so, you will be able to search the best profile who match your requirements using our platform, everything online, simple, fast and digital, using the best practices for digital transactions which follow market compliance rules. If you are a SAP consultant, you will be able to create your profile in our platform, inform your own rate/hour, and will become available for allocations (remote or onsite). Deep specialization and certified in SAP focused on international Rollout to Brazil, with strong expertise in implementing the Brazilian legal requirements, adapting global SAP templates to run in complex tax and legal scenario of Brazil. Using our platform, you will be able to find the best match to your needs. 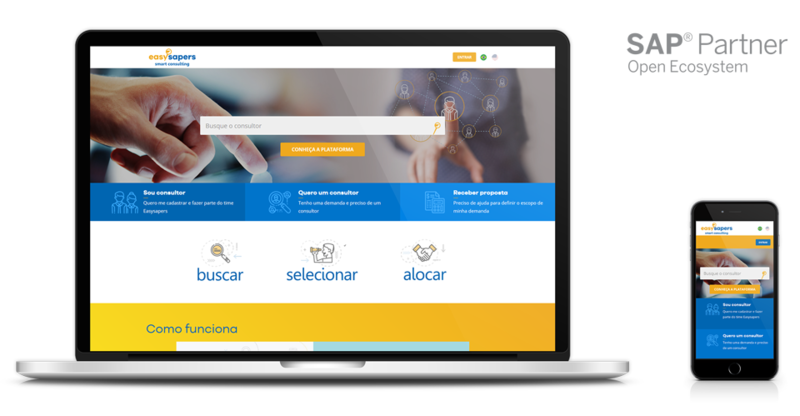 Currently our platform is running in full mode in Brazil, our company is growing fast, many customers already discovered the advantages of our services over the traditional consultancy firms. Now it's time to you to start ahead, our plan is to launch our platform for international market very soon, meanwhile, you can use this special page to create your high level profile with us. We have already +400 consultants available and ready to work, some of them with strong experience in international projects, work visa and English fluency. Create your profile today and be ready to come to the new era of SAP professional services. Sign up for free, create your account as consultant, as a company or send your requisition and we will analyze carefully. Up to now, we are receiving the profiles and reviewing, soon, you will be part of the next generation in SAP services. Basically choose below the best option who fit your profile, fill up the form and be ready to be part of Easysapers. Work mode: Onsite or remote?